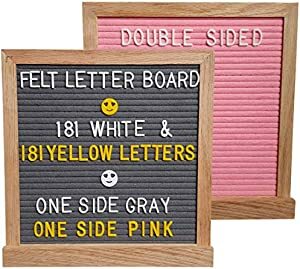 Amazon Giveaway: Pink and Gray, Double Sided Letter Board 10x10, 362 White & Yellow Letters, Oak Wood Frame, Changeable Felt Letter Board with Stand Included. Perfect Premium Gift! Pink and Gray, Double Sided Letter Board 10x10, 362 White & Yellow Letters, Oak Wood Frame, Changeable Felt Letter Board with Stand Included. Perfect Premium Gift!